Over the last three decades the CNC Department at Designcraft has evolved into an operation capable of handling machining projects that require precise tolerances, exotic materials, complex parts, and optimal efficiency. Going beyond traditional setups and machining practices, we creatively apply unconventional techniques to produce demanding geometries. As we move into the future, we embrace our heritage, our passion for innovation, and our reputation for being immediately responsive to your changing needs. Over the last three decades the CNC Department at Designcraft has evolved into an operation capable of handling machining projects that require precise tolerances, exotic materials, complex parts, and optimal efficiency. Going beyond traditional setups and machining practices, we creatively apply unconventional techniques to produce demanding geometries. You need a partner who is responsive to your needs during every step of your product development process. Designcraft provides valuable engineering support by examining your data prior to machining. Every part, every time. 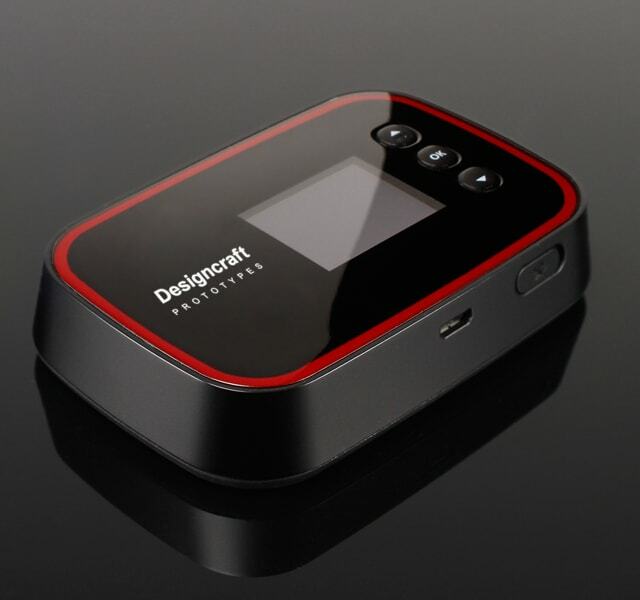 This ensures your design intent is captured and minimizes costly errors and oversights. When the pressure is on and the deadlines are tight, we are ready to be your second set of eyes to ensure your success. Making parts fast is never an excuse for them not to be accurate. 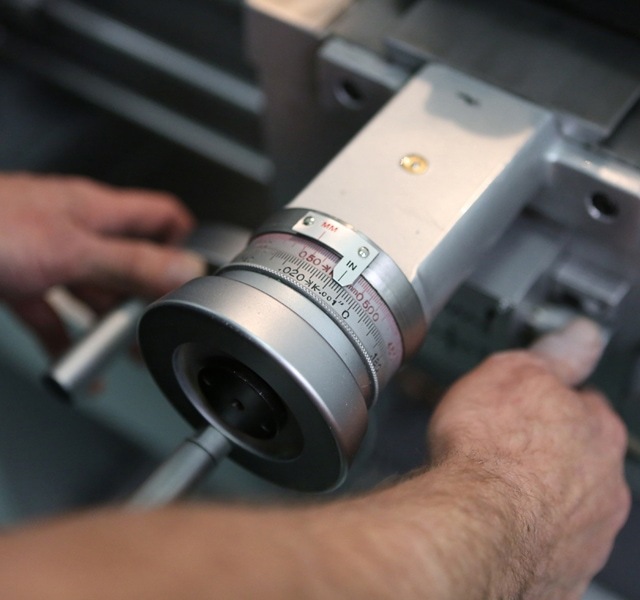 Our in-house inspection department maintains professionally calibrated equipment including both an Optical and Gantry CMM so you know your first article reports can be trusted. We also offer this as a standalone service if you want to validate other parts you already have in stock. Whether your parts need a quick sanding and media-blast, custom color anodizing, or showroom quality paint and graphics, our Finishing Department can make your parts look better than production. Do you have production, or pre-production parts that need finishing? We can add color, texture, and graphics to your supplied parts, too. 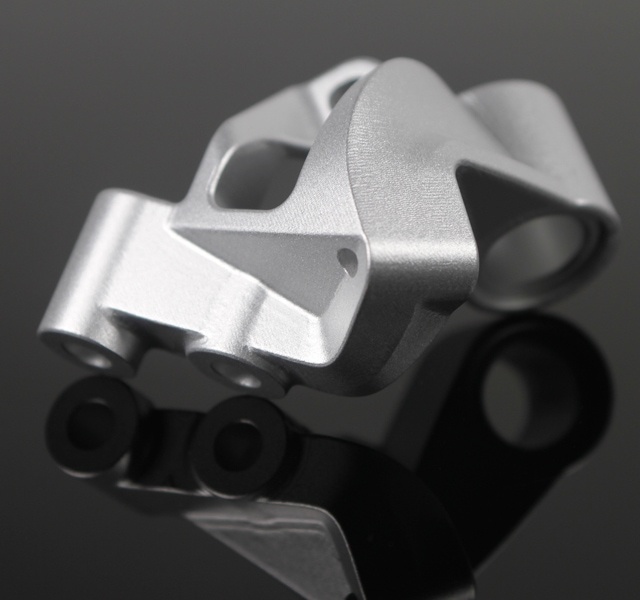 From prototyping to rapid manufacturing, and all steps between, your project will benefit from our CNC Department’s familiarity with unique situations, and the specialty equipment and tooling required to execute complex machining tasks right the first time, on-time and on-spec. With spindle speeds from low RPM (rapid material removal and hardened steel) to 45k RPM (micro tooling and superior surface finishes), our full range of 3, 4 and 5-Axis CNC machines can be setup to perform a variety of operations from quick-turn prototype runs to volume production. We use Toolpath Optimization for first-time success, and our streamlined workflow often allows us to start cutting your parts the same day. Your project will benefit from our CNC Department’s familiarity with unique situations, and the specialty equipment and tooling required to execute complex machining tasks right the first time. With spindle speeds from low RPM (rapid material removal and hardened steel) to 45k RPM (micro tooling and superior surface finishes), our full range of 3, 4 and 5-Axis CNC machines can be setup to perform a variety of operations from quick-turn prototype runs to volume production. Designcraft’s CNC Department is GD+T proficient, and capable of multi-sided tight tolerance machining. We commonly cut detail features with 0.005” endmills, and support from our engineering department helps ensure your complex parts will turn out successfully the first time. Designcraft can provide you with more ways to realize your design intent and manage costs by utilizing resources from our other departments. From machining details on printed parts to custom cut tooling for silicone castings, we excel at combining technologies and performing cross-process operations. Designcraft’s CNC equipment is complimented by our manual machining capabilities, which may allow for easier modification of client supplied parts, cost savings for manufacturing less complex parts, and can often be used to modify finished parts without expensive rework on CNC. 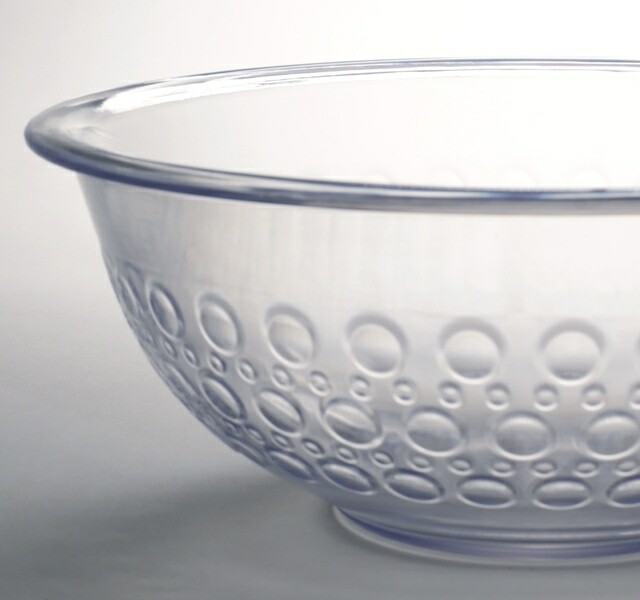 Are you struggling to find a source for CNC Turned prototypes because your quantities are low? Equipped with Automatic Tool Changing, Live Tooling, and a Sub-Spindle, Designcraft’s Multi-Axis Turn/Mill Machining Center single-handedly provides operations that would have taken multiple machines and setups to complete. These features provide us with the capacity to take your project, no matter how few (or many) pieces you need. Equipped with Automatic Tool Changing, Live Tooling, and a Sub-Spindle, Designcraft’s Multi-Axis Turn/Mill Machining Center single-handedly provides operations that would have taken multiple machines and setups to complete. These features provide us with the capacity to take your project, no matter how few (or many) pieces you need. Designcraft can provide you with more ways to realize your design intent and manage costs by combining technologies and resources from multiple departments. Designcraft has a range of measurement tools that can be used to verify the accuracy of your parts, depending upon the tolerance requirements of your project. 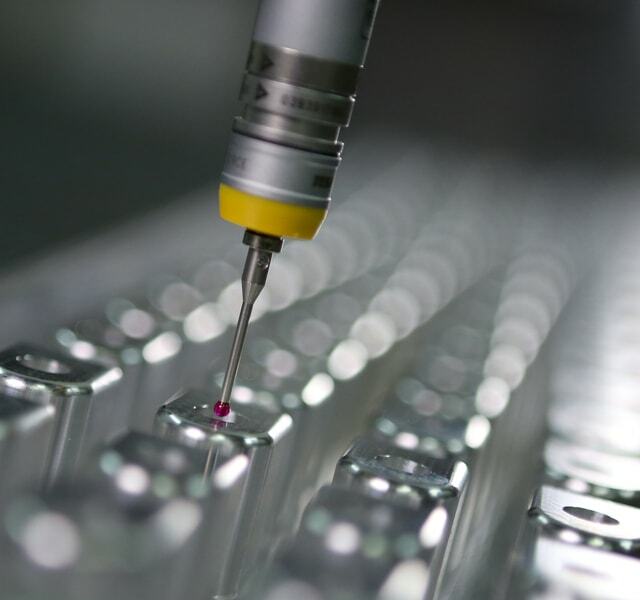 We can manually check reference dimensions with calipers and micrometers, or use our more sophisticated Optical and Gantry Coordinate Measuring Machines (CMM) for critical, tight tolerance situations. Our CMM operators are artists in the science of metrology. Designcraft has a range of measurement tools that can be used to verify the accuracy of your parts, depending upon the tolerance requirements of your project. 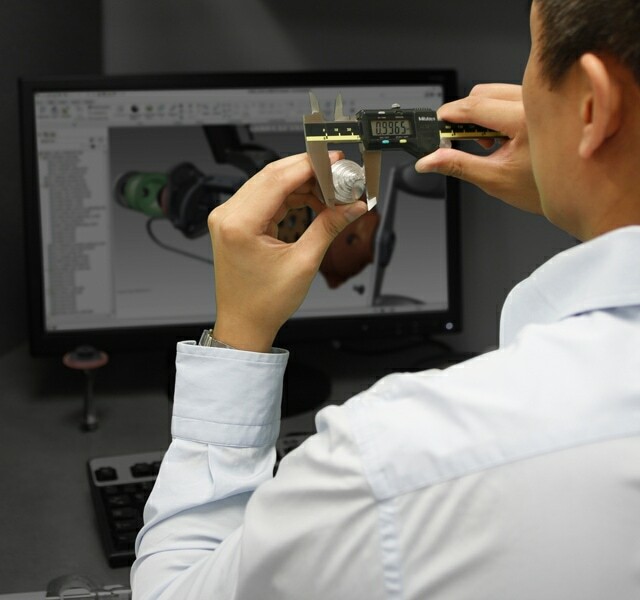 We can manually check reference dimensions with calipers and micrometers, or use our more sophisticated Optical and Gantry Coordinate Measuring Machines (CMM) for critical, tight tolerance situations. Your CNC Machined parts should be as beautiful as they are accurate. We don’t just finish the parts we make here. Do you have production, or pre-production parts that need finishing, or parts from another prototype vendor that need polishing, painting, or graphics? We can add color, texture, and graphics to your supplied parts, too. CNC Machining allows you to move from prototyping to low-volume production overnight. Run by Designcraft Operators in 2 daily shifts, our machines are equipped with Trunnions and Tombstones to reduce setup time and are often run lights-out. We are capable of fulfilling quantities in the thousands with our in house resources, and can source for any quantity.